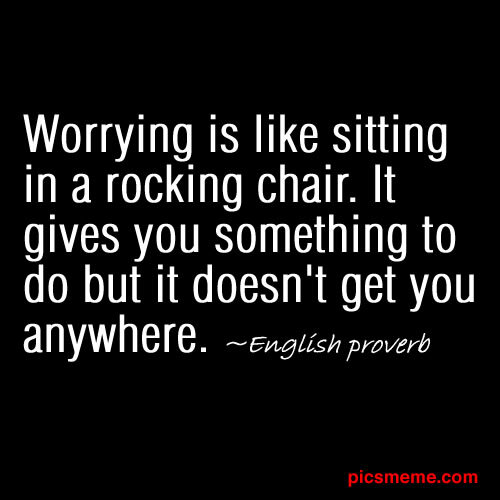 Some form of worrying is a common occurrence. But then there is the chronic worrier. If you’re preoccupied with “what ifs” and worst-case scenarios, worry becomes a problem. Unrelenting doubts and fears can be paralyzing. They can sap your emotional energy, send your anxiety levels soaring, and interfere with your daily life. But chronic worrying is a mental habit that can be broken. You can train your brain to stay calm and look at life from a more positive perspective. You can try keeping a log of your worries and re-read them at the end of the week. See how many of these worries were real. Try taking deep breaths and relax, taking in the moment. The very present moment. Once you have conquered the breathing try meditating, and staying in the present moment. Take a rubber band and put it on your wrist. Every time you begin to worry snap the rubber band and ask yourself how you are feeling right that very moment. Most of the time worrying is a habit we have formed to keep us stuck and feeling safe. If we worry we don’t have to do anything about the situation. The problem with that is it keeps growing and gets worse then you worry. It takes time to break the habit so be patient. You can break this trap if you work at it. It won’t be easy but you’ll feel better and more in control of your life. This entry was posted in Personal Growth, Reflection and tagged habit, thoughts, worry.